My nominee for best street food in the world would have to go to Turkey’s döner kebab, meat rotating on a vertical rotisserie spit, sliced thin and served up in a flatbread such as lavash or pita with yoghurt-garlic sauce and often with pickles, salads and other condiments, including hot sauce. Nearly every country in the Middle East has some version of this dish. Israel and the Arab world have their shawarma, Greece its gyros, but neither is quite as enticing as the original. Given the substantial Middle Eastern population in San Diego, there are more than a few places one can find some version of this brilliant street food. I have found none better than The Kebab Shop (303 W. Beech in Little Italy, with several more locations, thekebabshop.com). It’s as close as you can get to Turkey in San Diego. Döner kebab was actually invented in the early 1970s in Germany by Mahmut Aygun, a Turkish immigrant whose primary innovation was to present the Turkish dish of spit-roasted lamb over rice, but inside pita bread to allow customers who’d been drinking to more readily stumble off home with their food. Exported back to the Middle East, it conquered the streets. The word “döner” translates from Turkish as “turn around.” Similarly, “shawarma” is a corruption of the Turkish word “çevirme,” which translates as “turning” and “gyros” is the Greek word for “turned.” It’s the rotating vertical spit of meat that’s the essence of these closely related dishes. The term “kebab” means, simply enough, “grilled meat.” Thus, “döner kebab” means grilled meat that’s turned around. While The Kebab Shopís classic lamb döner is quite good, what they do best is the chicken döner. The lamb döner, like most gyros, is cut from vertical tubes of pre-pressed and pre-seasoned meat (often a combination of lamb and beef). The chicken döner, though, is sliced from a house-pressed tower of chicken featuring alternating layers of lean chicken and tasty fat. It is, quite precisely, what you’d find—and I found—on the streets of Istanbul. Of course, I also found El Torito there, but that’s another story. The döner, whether lamb, chicken or falafel (deep fried balls of ground chickpeas), is served burrito-style, with lettuce, tomatoes, cucumbers and two sauces (yoghurt-garlic and a “hot” sauce). 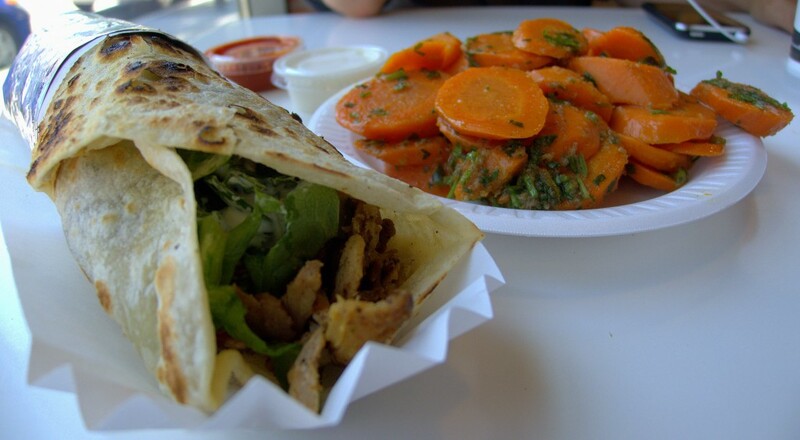 If you’ve tasted gyros, you have a reasonably good idea what the lamb döner is about. The chicken döner offers a profound and deeply savory meatiness that results from those layers of meat and fat, the rotating spit technique and seasoning that’s both exotic and strangely familiar. One disappointment at The Kebab Shop is the salads—meze—often the highlight of Middle Eastern eating. The hummus and tabouli are ordinary, and the Andalucian carrots lack both acid and seasoning. The best are the very fresh Greek salad and the green lentil and walnut side. While The Kebab Shop will not likely win awards for elegance or ambiance, it’s perfect for a quick lunch or on the way to a movie. And, as ever, it’s well tuned for döner kebab’s original intended late-night purpose.